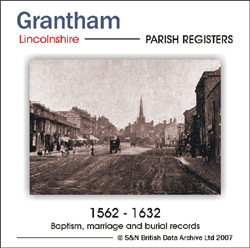 This volume, originally published in hard copy by the Lincoln Record Society in 1916, contains a transcription of the registers of the Parish Church of St Wulfram in Grantham. The entries were collated with the Bishop's Transcripts before publication, which filled many gaps in the registers. Seperated into baptisms, marriages and burials, the registers are supplemented by indexes of persons, places and subjects. The introduction gives the history of the parish and puts the registers into context. The digitally enhanced pages are easily readable in Acrobat, whether on a PC or a Mac, while both bookmarks and full text search can be employed. £17.45 plus £2.50 p&p. S&N, West Wing, Manor Farm, Chilmark, Salisbury SP3 5AF. 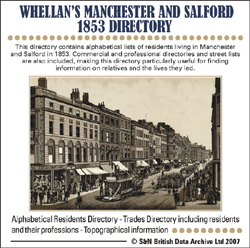 While this is described as a directory of Manchester and Salford, it actually covers an area akin to the post-1974 county of Greater Manchester. Besides the two cities, there are also sections on such major towns as Stockport, Oldham, Rochdale, Bury, Bolton and Wigan, as well as many villages and hamlets. Well over 1,000 pages contain both alphabetical and street lists of residents living in Manchester, Salford and these other towns in 1853. Commercial and professional directories also list those in business at the time. This directory is particularly useful given that parts of the 1851 census of Manchester were lost because of water damage. S&N has digitally enhanced the directory, which can be used in Acrobat by both PCs and Macs. Full searchable text makes navigation straightforward. £14.95 plus £2.50 p&p. S&N, West Wing, Manor Farm, Chilmark, Salisbury SP3 5AF.